Baseball’s dealing deadline has passed, but not before one of the most coveted players on the trade market switched uniforms in a three-team swap. 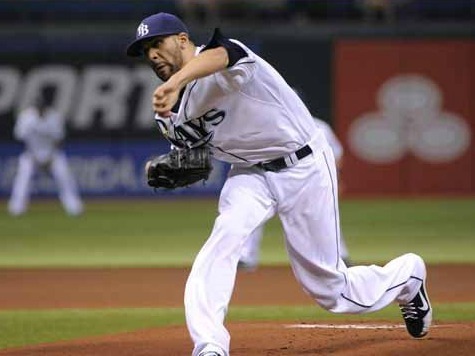 David Price, the hard-throwing ace of the Tampa Bay Rays staff, has been traded to the Detroit Tigers. Price enjoyed an 11-8 record with a 3.11 ERA and 189 strikeouts this season. Appearing in seven seasons for the Rays, the first pick in the 2007 draft compiled a career 82-47 record with a 3.18 ERA. Price highlighted his tenure with the Rays by winning the 2012 Cy Young award and earning a crucial ALCS Game 7 save that brought Tampa Bay its first World Series berth. The Rays make off with lefty Drew Smyly from Detroit and infielder Nick Franklin from Seattle. The Mariners grabbed centerfielder Austin Jackson from the Tigers. The trade marks Detroit’s answer to Oakland in an American League arms race. The A’s, which traded for Jeff Samardzija and Jason Hammel earlier this month before landing Boston’s Jon Lester today, appear all-in to go for their first World Series title in a quarter century. Price joins a staff that includes Justin Verlander and Max Scherzer. With Oakland boasting the best record in baseball, and Detroit five games ahead in the AL Central, the teams figure that facing one another in the postseason appears as an increasingly likely scenario.